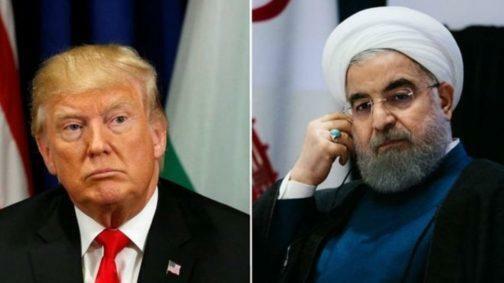 Iranian President Hassan Rouhani and his advisors are likely scrambling over what strategy to agree on, if any, in response to President Trump's unexpected and unprecedented Monday offer of "no preconditions" talks with Rouhani. An official response to Trump's surprise words — “I would certainly meet with Iran if they wanted to meet. I don’t know if they’re ready yet” — issued at a White House press conference was not immediately forthcoming afterward or throughout the day Tuesday. However, while Tehran's top leadership has kept mum on what it might be thinking, lawmakers in Iran's parliament didn't hold back Tuesday, with the deputy speaker of parliament declaring "it would be a humiliation" for Iran's leaders to sit down with Trump. Skepticism was rife in Iran on Tuesday after US President Donald Trump offered talks, with one lawmaker saying negotiations would be a "humiliation." The country's top leaders did not give an immediate response to Trump's statement a day earlier that he would meet them "any time" without preconditions. But several public figures said it was impossible to imagine negotiations with Washington after it tore up the 2015 nuclear deal in May. Iran's semi-official Fars News which typically reflects a more Islamic conservative angle, quoted Ali Motahari, the deputy speaker of parliament, as follows on Tuesday: "With the contemptuous statements (Trump) addressed to Iran, the idea of negotiating is inconceivable. It would be a humiliation." The same report cited Interior Minister Abdolreza Rahmani Fazli, who slammed Trump's statement, saying "America is not trustworthy," and questioning, "After it arrogantly and unilaterally withdrew from the nuclear agreement, how can it be trusted?" One Iranian government advisor and University of Tehran professor, Mohammad Marandi, who helped negotiate the 2015 nuclear deal, said, "We cannot negotiate with someone who violates international commitments, threatens to destroy countries, and constantly changes his position," according to Bourse & Bazaar. A new round of US sanctions are set to hit Iran starting August 6. Both current sanctions and news of the impending regimen have already contributed to an economy in severe downward spiral. Iran's rial hit a historic low this week after over the weekend the it took a stunning 12.5% dive, falling from 98,000 IRR/USD on Saturday to 116,000 IRR/USD by the close of Sunday. As Forbes noted this kind of classic death spiral hasn't happened since September 2012. And By Monday the currency hit 119,000 against the dollar on the black market, a new low. Thus far the only official statement from a top Iranian authority on the possibility of talks was actually issued before Trump's surprise remark of a "no preconditions" meeting. Foreign ministry spokesman Bahram Ghasemi said on Monday morning, "there is no possibility for talks" — though there's no way Tehran could have known of the US president's words ahead of time. "Washington reveals its untrustworthy nature day by day," Ghasemi had stated, according to the Mehr news agency. “Mr. Trump thinks that every morning the world wakes up with him. One should not take him seriously,” Ghasemi added ahead of Trump's statement. Though things are clearly not looking positive on the prospect of any kind of renewed direct face to face talks between the White House and Tehran, some Iranian officials have expressed openness. For example the head of parliament's foreign affairs commision, Heshmatollah Falahatpisheh, told the semi-official ISNA news agency, "Negotiations with the United States must not be a taboo." And he explained further, "Trump understands that he does not have the capacity to wage war with Iran, but due to historic mistrust, diplomatic ties have been destroyed." The White House for its part appears to have played a dangerous game that has involved creating an intense, high pressure environment of stringent sanctions and threat of military force, while simultaneously throwing out the proverbial "carrot" at the very moment things reach breaking point, which seems to be what Trump did Monday.